Asbestos siding was all the rage in the early part of the 20th-century. What Beanie Babies were to the 1990s, asbestos siding was to the the 1930s. Well maybe, it wasn’t quite the same, but you get the idea. It was immensely popular! If you are one of the folks whose house got dressed up with asbestos siding back in the day, all is not lost. There are ways that you can handle your siding safely to keep both you and your house safe. The presence of asbestos siding on your house is anything but a tragedy and hopefully through this post I can give you a little light at the end of the tunnel. Why Was Asbestos Siding Popular? 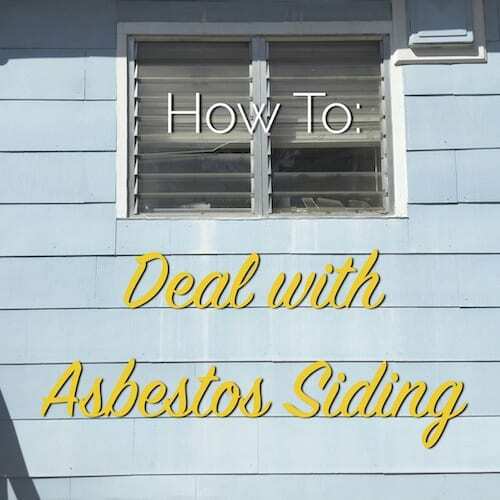 There are a couple of very good reasons why asbestos siding became as popular as it did. When you put them all together, I’m surprised that more old houses are not covered in the stuff. With the exponential growth in American cities in the early 20th-century, there came an exponential growth of urban fires. Cramming more and more people into our cities in close proximity meant that the house fires common to that time quickly spread from building to building in these crowded cities. Whole cities were destroyed like in the Great Fire of Chicago in 1871 that destroyed 3.3 square miles. The pattern repeated itself in cities like Seattle in 1889, Jacksonville in 1901, Baltimore in 1904, and many others across the world. Insurance companies needed a solution and providing massive discounts to building owners who installed fireproof asbestos siding was the right fit for the time, since the health hazards of asbestos were not fully realized. Those discounts were like an adrenaline shot to the asbestos siding industry. Asbestos is a naturally occurring element and is very plentiful and relatively inexpensive. Saving money on both insurance and materials costs was a big win for any homeowner. Asbestos containing materials were easily manufactured and shipped across the world as the Industrial Revolution rolled full steam ahead. Other than the fact that inhaling the fibers of asbestos can cause major health problems like asbestosis and mesothelioma, it truly is a miracle product. It is rot proof, insect proof, fire proof, requires no painting and no real maintenance at all, which was just as appealing to homeowners in the 1920s as it is today. How do you know if it’s even asbestos siding? There are always the usual suspects, but the surest way to tell is to grab a small chunk and have it tested. I send 1″ pieces to Western Analytics and for only $30 they’ll send me a report detailing if there is asbestos and if so, what kind and how much. Such a deal! If you’ve got old asbestos siding and it’s in good shape, then there is really very little you need to do. It should last decades with minimal to no maintenance. Regular painting of the exterior of your house never hurts, though. If you hate the look and want it all removed so you can bring your house back the original wood appearance, that can be done, but the only safe way to do it is by hiring a certified asbestos abatement company to safely remove and dispose of the siding. The area that most people fall into is when you have broken pieces that need replacement and you can’t afford full removal. What can you do? Fortunately, there are companies that sell replacement fiber cement siding that looks almost exactly like the old stuff. The new stuff just doesn’t come with asbestos included. Take look at GAF Fiber Cement Siding to find the pattern that matches your house and order what you need. Removing old asbestos shingles is not technically difficult, but anytime you are working with asbestos, you need to take the proper safety precautions to make sure you are safe. Those precautions are very similar to working with lead paint, which you can read about here. The danger of asbestos is when it is friable and becomes airborne. Once airborne, the small fibers get stuck in your lungs and will not come loose eventually causing sickness. Containing those fibers and preventing them from becoming airborne is the key. I won’t go into the details of working safely with asbestos, because that is way beyond the scope of this post, but be sure you do your homework if you plan to tackle the work yourself. The moral of the story is don’t feel like a victim if you have asbestos siding. You have options. It can be left alone and perform admirably for years, it can be completely removed if budget allows and it can be patched and repaired for relatively little cost or danger. While I wouldn’t add it to my house today, I wouldn’t have a problem if it was already there. Hi Scott. Being a former long time resident of SW Florida, reading your blog is entertaining, informative,a a small taste of my old stoping grounds. I got a real chuckle out of this post; not only do I have asbestos siding, I live in a city where the majority of the homes, including mine, are made from asbestos panels!